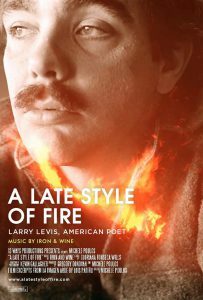 The Palm Beach Poetry Festival is pleased to support, in partnership with our friends, Palm Beach International Film Festival and O,Miami, the Florida premiere screenings of the feature documentary film, A Late Style of Fire, about the life and work of poet Larry Levis who died abruptly at the age of 49. Off his walk. It sounds like the scrape of the rake. The soul is just a story the scraping tells. Is self-destruction required for a serious life of art? Larry Levis is a poet who addressed this issue head-on, in his work and in his living. And he encountered and had friendships and relationships with contemporary living poets who are interviewed for the film. What is the story of Larry Levis and what is his creative legacy? A Late Style of Fire presents an opportunity to explore the artist’s life through the eyes of some of America’s most important poets. The film itself has a poetic and lyric quality as created by filmmaker and poet, Michelle Poulos and producer and poet, Gregory Donovan. Poets appearing in the film include U.S. Poet Laureate Philip Levine, U.S. Poet Laureate Charles Wright, Carolyn Forché, David St. John, Carol Muske-Dukes, Norman Dubie, Colleen McElroy, Gerald Stern, Stanley Plumly, David Wojahn, Kathleen Graber, and more. A talk with filmmakers Michele Poulos and Greg Donovan with breakfast included. RSVP required here.